Our CSEA members from the Cornwall Central School District Unit. Members there work in buildings and grounds, as well as working as custodians. CSEA also proudly represents district cafeteria workers in a separate bargaining unit. 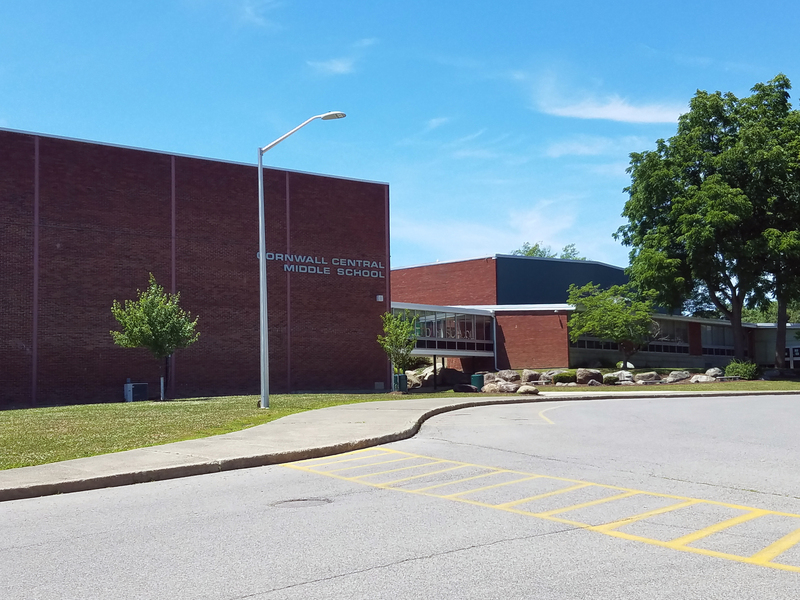 Outside of Cornwall Central Middle School, where CSEA members stepped into action to keep students and community members safe. CORNWALL – Things don’t quiet down at Cornwall Central Middle School the moment the final bell rings and students head home for the day. On any given afternoon during the school year, you’ll find students participating in sports and extracurricular activities, teachers prepping for the next day and CSEA members working both inside to clean the sprawling building and outside maintaining the grounds and athletic fields. The afternoon of May 15 was extra busy. In addition to the day’s normal school activities, community members at the building participating in the district’s budget vote and school board elections. Administrators were also gearing up for that evening’s middle school orientation. Things quickly changed, however, when the clouds darkened and the winds suddenly picked up. “It got dark outside and then, all of a sudden, it just sounded like a jet took off,” said Bob Sherman, a custodian working at the middle school. What he heard was the sound of the rolled rubber roofing on the school gym being ripped off by the winds, all while residents were inside the gym casting their ballots. Sherman immediately began evacuating people, moving them to safety in the school auditorium. 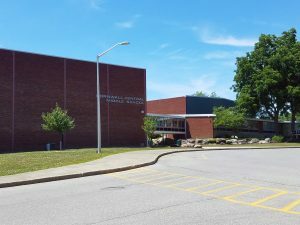 Sherman’s boss, Cornwall Central School District Director of Buildings and Grounds Walter Moran, quickly closed the other schools in the district and diverted custodians to the middle school to assist their co-workers. Heavy rain began pouring into the gym. As his CSEA-represented co-workers moved voting equipment out of the gym, Sherman hopped aboard a riding Zamboni machine and began the tedious task of removing hundreds of gallons of water. Despite the extreme weather, which resulted in fatalities in nearby communities, the teamwork by the CSEA-represented workforce allowed for voting to resume, with people waiting in long lines as poll workers had to move balloting to a crowded hallway. “I just wanted to get people out of the gym,” said Sherman, who said he’s never seen anything like that day’s weather during his 19 years with the district. In addition to the roof damage, the rain caused the gym’s floor to buckle, essentially destroying the gym. Because the damage was too severe for in-house district staff to complete, contractors are repairing the damage over the summer. District officials noted that the project is slated to be completed by the early September, when the new school year begins. Events like the May storm give community members the chance to see CSEA members at their finest, swinging into action. However, the everyday work of keeping the district running showcases the excellence behind the scenes. Not only do our members working as custodians keep buildings clean and well maintained during the school year, they do a tremendous amount of work over the summer while buildings are empty, so students and other staff aren’t affected by heavy-duty tasks such as stripping and waxing floors. Meanwhile, our members working as building and grounds staff make the magic happen during district events such as graduations, moving up ceremonies and football games. 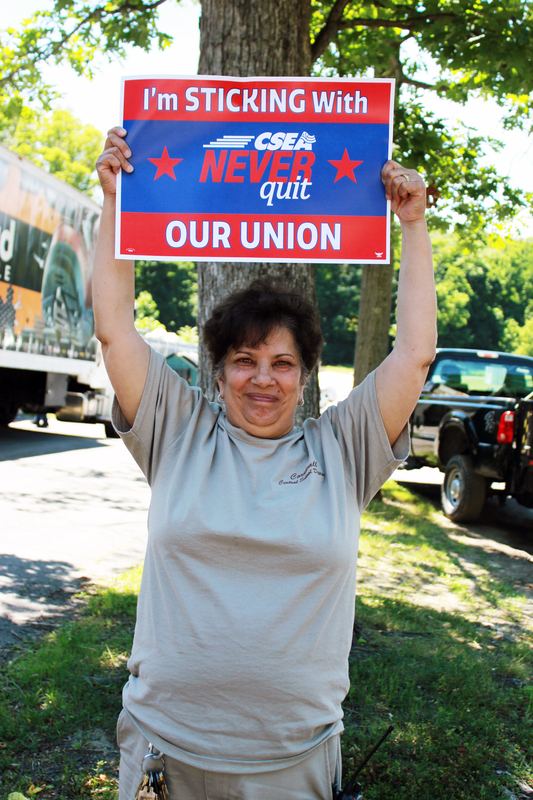 CSEA member Maria Ortiz, a custodian who will retire in August after over 11 years with the district, shows her union pride. The buildings and grounds crew made kids at two district elementary schools ecstatic as a result of their work. CSEA members dismantled two dated playgrounds and joined with community groups to replace them with brand new, modern equipment that is so popular that kids and their parents often return to school in the late afternoons and evenings for more playground time. For CSEA members such as custodian Maria Ortiz, who plans to retire later this summer, the work is gratifying. “I came to work here when I was laid off from a job in the private sector after 32 years,” Ortiz said. “I came here for the benefits, but I’ve had a chance to float between the different schools and I’ve really loved it.